In this recent post we discussed the seeming dislocation between levels of crude oil price (in this case WTI) and US equities (S&P500). Some readers have pointed out however that this may be driven by unusually high US crude inventories (particularly in Cushing OK, where WTI futures settle). 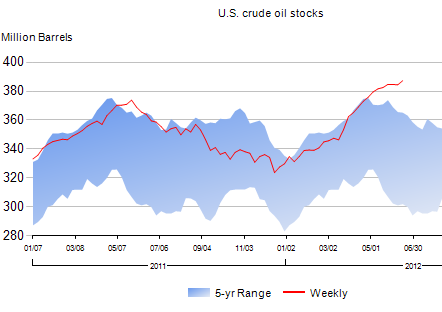 The US crude stocks have indeed been on the rise, materially above the 5-year range. OK. Point well taken. But let's do the same analysis using Brent crude (instead of WTI), which should not be directly impacted by US crude inventories in Oklahoma. 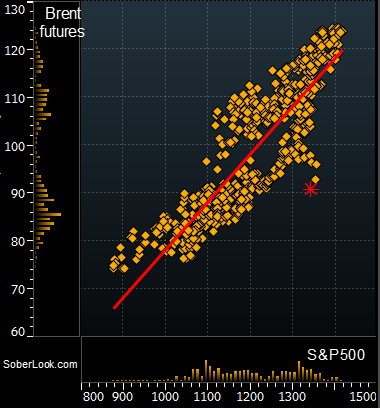 Here we have the last 3 years of price data on a scatter chart - and the same anomaly still exists (in fact it's even sharper today than before). Again, it may be an issue related to global supply. But that should simply be a reflection of world economic activity. One would think the equity markets would be reflecting this contraction in growth as much as the energy markets have. That has not been the case, as US equities continue to be resilient in the face of the slowdown. It's not clear however if this dislocation is sustainable going forward.